"It isn't me! It isn't me, don't you understand! I'm not the Intelligence! The Intelligence is him!" Evans and Arnold escape the fortress' destruction with Evans fleeing from the sergeant. The Doctor returns his Yeti to Intelligence control until it's needed. They meet first the Colonel & Jamie then Arnold and move towards Piccadilly Circus. They are soon captured by Yeti as is the lone Evans. Arnold manages to escape. Travers and Victoria are brought to the ticket hall at Piccadilly Circus where they catch sight of a figure in the shadows. 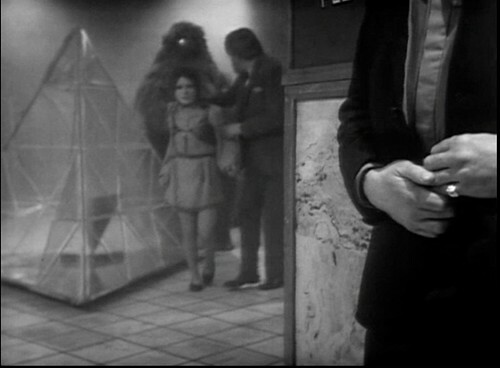 Dominating the hall is a large glass pyramid which Travers thinks the Intelligence will use to drain the Doctor's mind. Arnold find the long missing journalist Harold Chorley in the tunnels and takes Chorley with him. 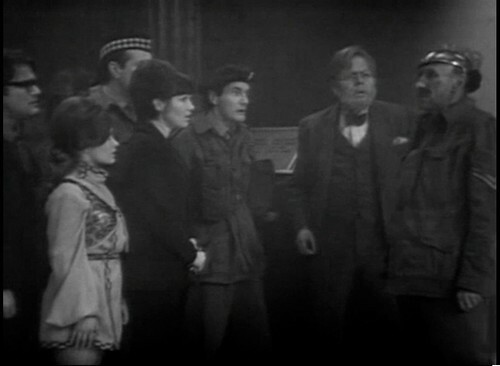 Evans is brought in to the prisoners and The Doctor taken away. He immobilises the Yeti and alters the helmet apparatus they're carrying before reactivating the Yeti and continuing. Everyone is brought to the ticket hall. Chorley enters propelled into the room by the Intelligence's servant: Staff Sergeant Arnold. Jamie is brought in by a Yeti. The Doctor is placed in the pyramid and the machine activates. Jamie orders his Yeti guard, the one brought under control earlier, to attack the Pyramid and the Yeti. The Doctor is rescued and the Pyramid destroyed, killing Arnold and immobilising the Yeti. The Doctor is distraught: he'd altered the device so the intelligence would be drained into him and not the way the Intelligence had planned. Now it's free to wander again. The Travers praise him as a hero. Making their farewells the time travellers return through the now clear tunnels to Covent Garden. A great final episode with the Doctor cooking up a plan that gets ruined by his companions! You feel sorry for him at the end, but he's known Jamie long enough to know this is exactly what he'd do. This whole story is cracking, looks and sounds superb! I've been convinced for a while that Haisman and Lincoln are better writers than given credit for and with this episode they proove they know their craft of writing for television. By destroying the HQ at the end of the previous episode it makes room in the studio for the Booking Hall set which has something rarely seen in a Doctor Who interior: a roof! I'll admit I was worried for Evans at this stage as that looks very like the scene in Pyramids of Mars where the Yeti's crushed by the poacher but no, all they do is pick him up and carry him off. Meanwhile the Doctor, Jamie, Lethbridge Stewart and Anne have been herded onto Piccadilly Circus where, between scenes, Jamie vanishes to hide in a box. I think here we have to assume that the Doctor uses his control device to over-ride the Intelligence's signals allowing Jamie to hide. The question is does he wait until the Yeti guards turn their backs, keeping the device a secret from Lethbridge Stewart, or does he use it openly bringing the Colonel into his confidence? Eventually though, like the end of a good Agatha Christie Novel, everyone's herded into one place for the big final revelation. It's Arnold, controlled by the intelligence, a very different performance from Jack Woolger to what he's delivered earlier as Arnold. The difference is incredible! The clues are there is you know where to look: how did the Yeti know where the explosives were in the first episode? Needs to be one of the team that planted them. How did Arnold know that the Doctor hadn't been caught by the Yeti in episode 2? He'd have had access to everyone's battle gear to plant the statues. Most importantly how did he survive going into the web in episode 4? The suggestion here is that Arnold was one of the first caught in the web - has he been a liefeless Zombie for the whole story or has he only been the Intelligence's control till it needs him? This is the last we see of the Great Intelligence until it's return in the 2012 Christmas Special, The Snowmen, that contains lots of hints to this story. Enough hints that makes me think that Steven Moffat may have had an inkling that it could be returned soon. We'll see other similar beings in the series: the Nestene Conciousness, Mara and Fenric spring to mind as do the Guardians, Eternals and Celestial Toymaker. An attempt to link these beings together as the survivors of another universe can be found in the New Adventures novel All Consuming Fire. 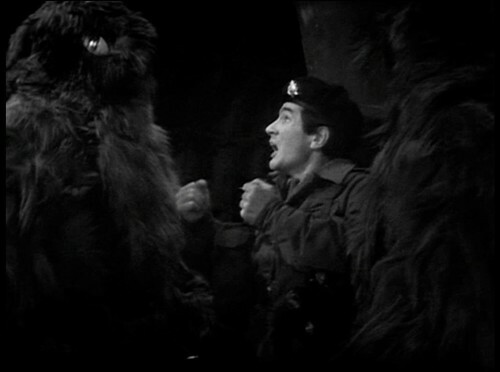 It's also the last full appearance of a Yeti though we'll see cameos in both the War Games and Five Doctors with a flashback in Mawdryn Undead. The Yeti in the Underground is, when you think about it, such a bonkers idea. Foam and or Web, yes, but Yeti who you'd expect to see up a Himalayan slope? Possibly this is some of the reason the story works so well placing an unfamiliar element into familiar surroundings. As Jon Pertwee observed there's nothing as scary as a Yeti on the Loo in Tooting Bec! Both of the Haisman & Lincoln six parters are cracking, probably the best Doctor Who stories I've encountered so far. They're great 6 part stories, the best examples in Doctor Who where instead of sagging in the middle or suddenly changing direction they just increase the tension a some more. I waver between the two though as to which is better! Before the return of the Web of Fear episodes I would have said Abominable Snowmen probably had a narrow edge, that being no slight on Web of Fear. But now I have four more episodes of Web of Fear it's no longer a level playing field and Web's going to win every time especially as all four episodes turned out to be better than I expected. But both stories are magnificent: I only hope Phil Morris can find more of Abominable Snowman so that story is not at a disadvantage in a fight between them and help me make a more considered judgement. Next episode Fury from the Deep 1 represents the start of an eight episode missing run through to Wheel in Space 2. But after that there are just 9 missing episodes: Wheel in Space 4 & 7, Invasion 1 & 4 and Space Pirates 1 & 3-6. 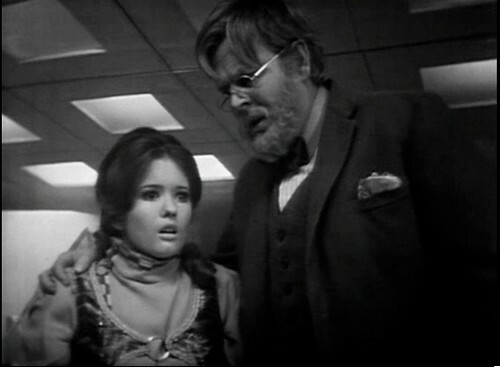 Web of Fear was novelised by Terrance Dicks, who had made his Doctor Who debut on this story as assistant script editor, and was released in August 1976. All six episodes of Web of Fear were issued as a soundtrack cd with narration by Fraser Hines which was released on 6th March 2002. The Soundtrack was re-released in a 2-pack with the previous Yeti story, The Abominable Snowmen, called Yeti Attack in 2003. In November 2003 the surviving first episode was released on video with the remaining two episodes of the Faceless Ones as part of The Reign of Terror boxset with the four surviving episodes of that story. In early 2004 the surviving episode 1 was released again as part of Doctor Who - Lost In Time. While searching Africa for missing episodes Philip Morris discovered copies of Enemy of the World 1-6 and Web of Fear 1, 2 & 4-6 at a television station in the Nigerian city of Jos. It hasn't yet been revealed exactly when he found it but a report in Doctor Who Magazine 486 has Morris talking about a church being blown up in the city while he was there. Paul Vanezies of the Restoration Team had his hands on the episodes on 31st May 2013 at the BBC's archive in Perivale. Peter Crocker started work on the picture restoration on 16th August 2013 and delivered it on the Friday 4th October. After much rumour the recovery, along with that of Web of Fear, was announced at a press conference on Thursday 10th October 2013 news of which was embargoed till midnight when the episodes were released on iTunes. The Web Of Fear is due for a DVD release on 24th February 2014, the 46th anniversary of the broadcast of episode 4. Web of Fear is currently available to watch on Virgin's On Demand service. The return of four episodes of this story brings the number of existing sixties episodes helmed by Douglas Camfield up to 20 out of the 35 that he made. The missing episodes are The Crusade 2 & 4, The Dalek Masterplan 1, 3 & 4, 6 - 9 and 11 & 12, The Web of Fear 3 and Invasion 1 & 4. It's a shame that so much work by Doctor Who's greatest director is missing but I'm glad that so much of this story which I'd longed to see for many years does now exist. Even now, a month and a bit later whenever I watch an episode I still can't quite believe it's really back. When asked which story I'd most like back in the run up to the returns being announced I had Web of Fear at number 2 - Abominable Snowmen was my number one choice and it was followed by Power of the Daleks, Evil of the Daleks and Dalek Masterplan. Now I'm having to rethink my top 5 most wanted list to work out what the new number 5 is: Galaxy 4 ? The Myth Makers? The Smugglers? The Faceless Ones? Fury from the Deep? I can't make up my mind. What I am almost certain of is that the Philip Morris/Doctor Who returns story isn't over yet. The piece in Doctor Who magazine 466 was very optimistic to the point of being "nudge nudge wink wink more on the way". So I'm very hopeful he'll find some more and return them to the BBC. Popular rumour claimed that Marco Polo was going to be returned with these two stories and, given the number of prints of that sold, I could well believe that has been found. There's 3 significant dates coming: tomorrow, the 50th anniversary itself, Missing Believed Wiped at the NFT on 21st November and the 50th anniversary of the broadcast of Marco Polo next year. Any of those might make a good point to announce a recovery. Another point to bear in mind is that Enemy of the World & Web of Fear were sold to the TV station in Jos as part of a package with the Abominable Snowmen and Wheel in Space. As yet I've not seen anyone answer what happened to those two sets of film prints. 97 Doctor Who episodes as missing from the archives. This table lays out which stories have missing episodes and, where applicable, the countries which bought prints and hasn't returned them/passed them on/confirmed them as destroyed. * Prints for Web of Fear 1, 2 & 4-6 found. We don't know what happened to Nigeria's part 3 yet - it was missing from the archive when Phil Morris found the other episodes there. Reign of Terror sold to Eight countries which are unaccounted for. Of course this relies on the BBC's paperwork being correct: there have been some recent suggestions that certain stories not known to have been sold to Africa may have been passed there by another broadcaster. And, as we've seen many times, individual collectors can have almost anything in their possession! Anyway well done to Phil Morris and his team for this incredible find of nine missing episodes and here's to many more recoveries to come. Tomorrow..... Well I suspect you can guess what episode we'll be rewatching then!